I got this enchanting ball of cobweb yarn from the sale bin at Webs two years ago, thinking I'd find a perfect leafy lace shawl pattern for it, but worried in the back of my mind that I pretty much never like the way lace looks in multicolor, even with really long gradual color changes like this. Finally, realizing that I just love the colors in this yarn and the way it looks in the ball, with hunks of color right up against each other, I'm going simple. Size 1 needles, 30 sts to a block, garter stitch entrelac (which keeps the colors feeling distinct and also more mixed than a straight pattern would). 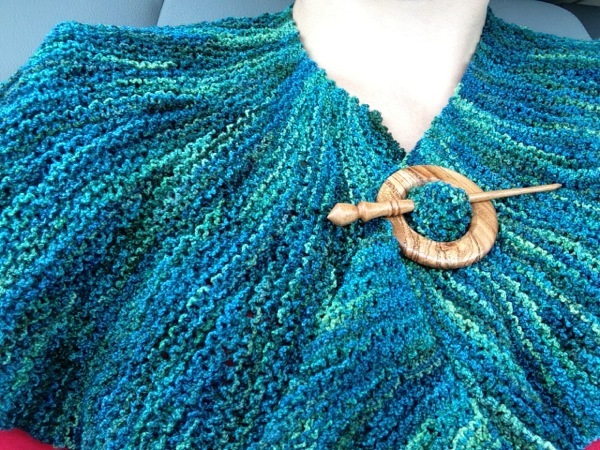 Loving it every bit as much as the ball of yarn (more, probably, since I'm now imagining tying it casually at my neck to compliment a pair of jodhpurs and a fitted corduroy coat, neither of which I own nor would probably wear more than once... let's hope it looks good with a t-shirt). The colors are a bit off here, the pink isn't so bright really! And there's a certain amount of brown. Basically, the palette looks like it was lifted from the most beautiful photo of fall leaves you can imagine. Still slowly settling in at our new home on our new coast. Finished the knitting on my daughter's sweater just before we got here, but took ages to dig out the yellow thread I decided I wanted for the buttons. Sweet little red flower buttons. Sigh. Two problems though: (1) daughter decided she didn't like them (actually, she decided she didn't like the color of the whole sweater, but I managed to get her to agree that she might like the sweater ok if she could have buttons in her favorite color) (2) they were just a tiny bit too small to stay closed (this was somewhat serious because the sweater is intentionally on the large side and the neck is a bit more open than I'd intended, so it slips off her shoulders easily if it comes unbuttoned). We got out the button box and looked for pink buttons (pink was her favorite color that particular hour). But I didn't have pink buttons, or not enough in the right sizes that went together at all well. I talked her into white flower buttons with a pearlescent finish, which I convinced her could be thought of as "sparkly" (because there was one solitary sparkly pink button in the button box which she had become very attached to), and which I promised could be sewn on with pink thread. Out came the thread box. And, of course (how could I not have predicted! ), she wanted many different shades of pink (and blue, and purple), not just one! So, this is the sweater with its new, better-sized and daughter-approved buttons sewn on with four different colors of thread. As an experiment, I added a second top button to make the neck a little snugger, but I might take that off someday. Can't quite decide if it looks ok or too weird. Sigh. This is our fourth of twelve days driving. Actually, ten days driving because two days will be not driving. I've run into an unanticipated problem, which is that I have pretty much never had this much knitting time day after day after day. It seems like I should be producing finished projects at a rapid rate (you can see from the size of my knitting duffle that I was more worried about running out of yarn than anything else), but my circular shawl is slow going and the little sweater I also have is at a smallish gauge. Most troubling, though, is that this amount of knitting time is straining my hands and I'm trying to be careful not to get myself in a position where I have to just NOT KNIT for an extended period of time! Perish the thought! Fast forward an hour or so. I slip into the dressing room to ooh and ah at the bride, who is gorgeous and whose dress is exquisite... frills and crinolines and a train and a bazillion itty bitty buttons with real loops that had to be closed over the zipper. This task was being attempted with fingers, but it was becoming clear that would take way more time than we had. A crochet hook, we said, Didn't people use to use a crochet hook for this? We had no crochet hook. Lockable stitch markers seemed the next best bet, but didn't work at all. Size 9 knitting needle, though? Quite serviceable. So the maybe-it's-a-metal-file attachment for the drill did not work for smoothing off the ends of my improvised blocking wires. 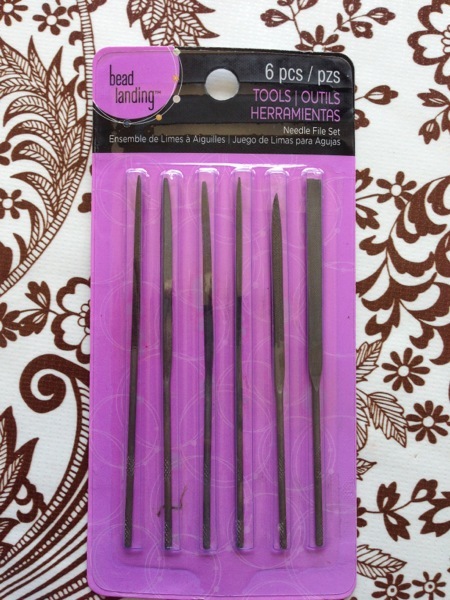 But in the jewelry tools aisle at Michael's (craft store), I found this set of tiny metal files and they've worked fine. No blocking wires anywhere to be had for love or money (or, Amazon has someone who would sell them to me, but they come with their own sandpaper because you have to smooth the ends off yourself and they still cost $24 and I'd have to wait for days for them to come), so luckily the Internet can supply DIY guides for almost anything, right? I found this one at Another Long Yarn, but no welding supplier with stainless rods seems to be around me, either. 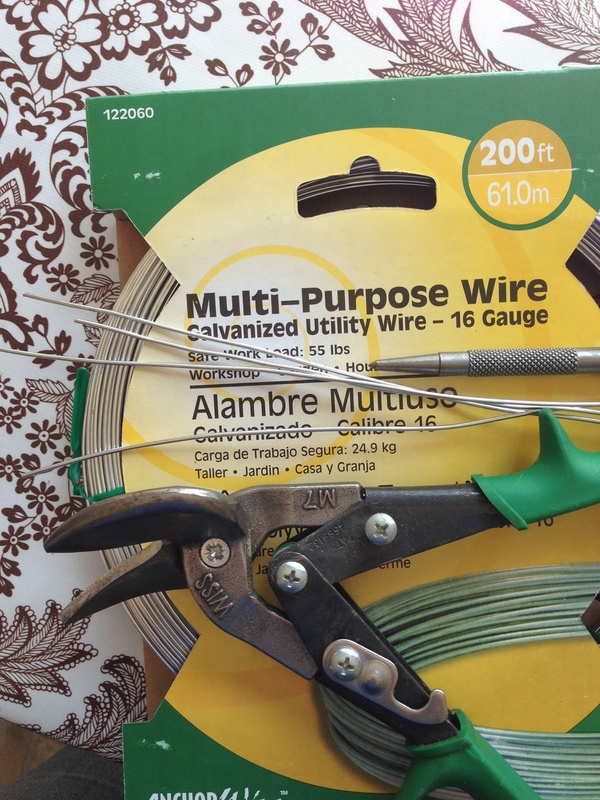 Desperately trolling the aisles of Lowe's, I did find galvanized wire that seemed about the right weight, and the Internet tells me galvanized means no rust, so I'm trying it. Cordless drill battery currently charging, for the rounding off the ends bit. I'll let you know how it goes. It's not really possible to get the wires perfectly straight, but I think that's ok. Fingers crossed! Finally! And no more linen for me for a while! Anybody want to tell me where to get blocking wires? I think I really need them now. This is what my Lacy Hug-Me-Tight looks like at the moment. How obvious is it that I'd rather be (hrmph, maybe have been) playing with my spongey squishy spiral splurge instead? I have a tote bag which my crafting friends wrote quotes on as a goodbye gift. One wrote, "Life is too short to knit with cheap yarn." And then she took me to the local yarn shop because they were having a sale and I walked out with a single skein of yarn that cost at least five times what I normally spend on a single skein and which was NOT on sale. Mountain Colors, Half Crepe skein in color way Peppergrass, 100% merino. I'm using US size 9 needles. Why Doesn't Knittrick Work on the iPad 1? I got this question recently and I thought maybe it was worth answering publicly because I know there are a lot of iPad 1 owners out there and I know it's frustrating that more and more apps aren't compatible with the first iPad. Most importantly, I want you to know that I did not take this decision lightly. An iPad is a big purchase for many of us and these devices are made so well that they still look and work pretty much like new for years. I get that it doesn't feel right to "have to" purchase a new one just so you can get the latest software. It might be harder to understand why a developer (like me) would decide to release an app that requires iOS 6, when there are still lots of people out there with iPad 1's that can only run iOS 5 and would still really like to buy this app! It certainly is possible to write an app that runs on both. I've done it, actually. My first app, Cross It Off!, launched in early 2011 (before iOS 5 even came out). The upgrade to iOS 5 wasn't too difficult and I was able to require iOS 5 fairly quickly because pretty much everyone was able to upgrade their devices to iOS 5. The switch to iOS 6 caused a lot more headaches for me, which have taken a long time to fully iron out. Partly, that's because I was also writing a new app (Knittrick) and going to graduate school and raising two small children at the same time. Whee! But I can definitely tell you that it would have been an easier process if I had just said, "Sorry, but you have to be running iOS 6 to use this app from now on." That's because little irritating things change from one iOS version to another, things under the hood that a customer will never notice... unless an app fails to deal with it properly. One case in point: the way you allow or don't allow the screen to rotate when you rotate your device changed in iOS 6. Changed in a way that totally broke a small but important feature of Cross It Off! (you can lock the screen so that when you're shopping, your list doesn't rotate all over the place just because you can't pay close attention to keeping your phone level while you bag the apples). Unfortunately, fixing it for iOS 6 then broke it for iOS 5! Which required more fixing. It works now, on both, but it was a real pain to get right when I had other priorities on my plate. On top of that, each new version of iOS has a bunch of technical goodies that make a developer's life much easier or allow apps to do things that previously could not be done. Again, these are things that a customer probably won't notice. But they make a big difference to the person writing and maintaining the code. For example, Knittrick uses the new layout system, which makes it easier to make to app look and work well on screens of different sizes and shapes. It also relates to how the animations are done (for instance, how the calculations area slides up to make space for the keyboard and how the menu opens and closes). That new system simply won't work in iOS 5. As I continue to build my business, I have several more app ideas that I hope you and others will enjoy using. I know from experience that I have to plan ahead to make maintenance of all my apps as simple as possible so that I can keep my existing apps running well, while still having time to create new apps and cover all the other aspects of running a small business. With all that in mind, I will do my best to keep my existing apps running on any device that could have run them when they were first released. And I will require the most recent version of iOS for new apps. I hope that helps explain the reasons behind these decisions, which I know can seem arbitrary from the outside. Thank you for reading and thank you for your interest! One sleeve of lace is finished blocking and it does look nice. I love the loops along the edge (formed by a yo, k2tog t the beginning of every other row that just gets knit into as normal at the end of the next row). 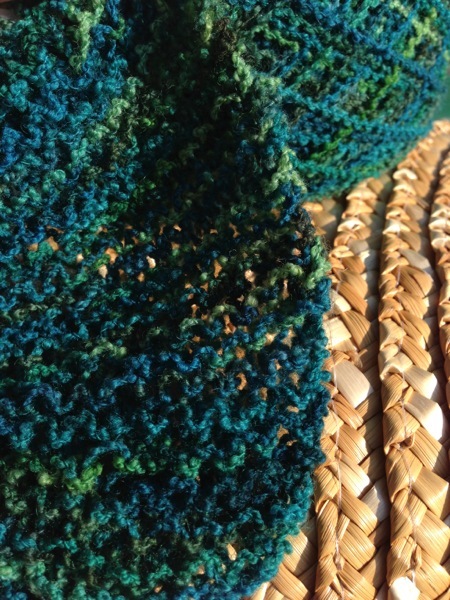 A lovely effect in the kind of yarn that can give those loops enough power to stay loopy. Which I think this yarn is, though I have considered starching this thing when it's done! I'm on my "real" computer today, so I'll be putting in real links! 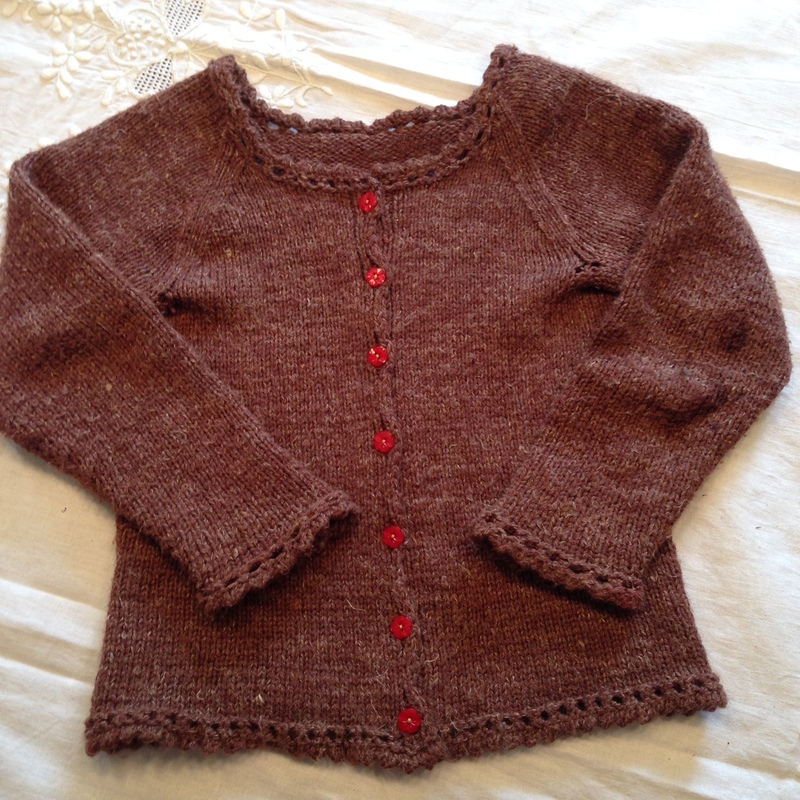 As much as I wish I were plowing through the sweater I started for my daughter, I'm devoting all my knitting energy to "the shrug". 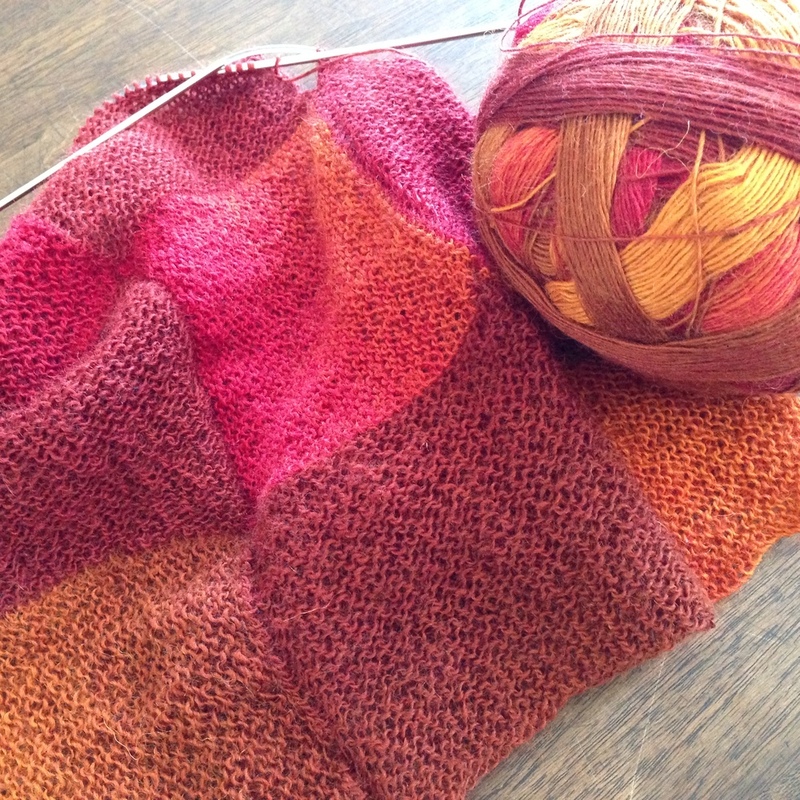 I don't know about you, but when people (non-knitter people) ask me, "What are you making?" and I say, "A shrug!" they look at me blankly. Being as out of touch as I am, I just assumed shrugs were a normal thing you could, like, shop for. Either way, I bet you know what a shrug is. Or you will shortly. And then you will want to knit one! This is me trying to decide if I've knit enough of the body section (by clipping one sleeve on). I think I have. Which is about 20" in length instead of the 60" the pattern calls for! (That's the slight modification.) I might decide to add a little more, but I'll get the other pieces done first to be sure. The other slightly tricky bit was grafting the provisional cast on to the final row — the number of stitches matched so I didn't bother with trying to simulate the two yo k2tog's that should have been in the last row (the grafting row, the row you sew in, is the last row, i.e. I didn't knit the final row of the final repeat). There was a triple yo (yarn over) in the previous row, though, and figuring out how to graft that was harder than I thought. To be honest, I'm not sure how I finally did it, but I did it and I guess I'll figure out something similar again the next two times I have to. My mom found a box of yarn in the attic last year and it came to me, because I'm the only one who uses yarn and because it was mine originally, anyway. Or, secondarily, actually, since it came along with a secondhand loom my indulgent parents bought me when I was in high school. It's good yarn, in that it's all wool or wool blended with other natural fibers. But it's also old yarn, "permanently moth-proofed", and colors I didn't choose. 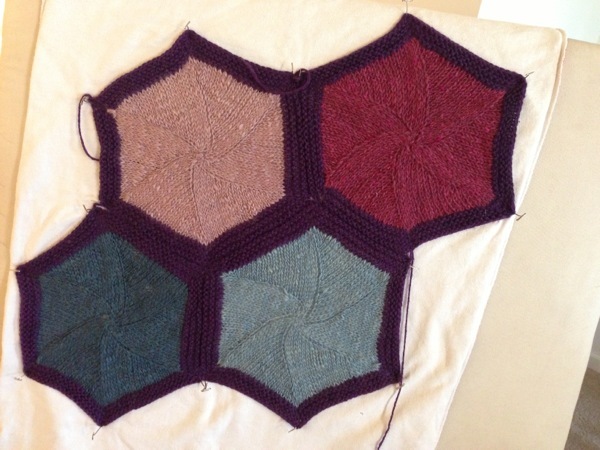 I decided it could be a good afghan if I picked the border color and, because a friend had just started a fantastic hexagon quilt and I was jealous of all those tesselating hexagons, I made hexagons. I started by casting on a ring and thought I'd work outside-in because I like decreasing better than increasing, but that was no fun at all. I hate casting on and I really hate knitting into the cast-on row, much much more than I dislike increasing. Inside out worked much better and I whacked out four patches, sewed them together, and then left them sitting around in a rumpled heap as I fretted over whether they would ever block flat (and fretted over my last semester of grad school, that too). But what do you know? They WILL block flat! Also, "permanently moth-proofed" yarn smells awful when it's wet. A very sad situation! Perhaps it would be different if what I had going wasn't two feet of 2x2 rib in 100% linen. Or if the pollen wasn't visibly billowing through the air these days. Or if I wasn't one week away from done with my Master's degree. I have one and a half sleeves of the brown sweater I showed you last time, but that project is on hold in favor of the Lacy Hug-Me-Tight from Knit 2 Together which I am hoping to wear for my graduation in a few weeks or, at the latest, a couple of events in June. First step: quite a bit of 2x2 ribbing! This is only the second time I've knitted with completely inelastic yarn (this is 100% linen, "Flax" by Fibra Natura; the last time was Silken Straw by Alchemy). I've found I have to do a long test swatch just to get myself used to the tension I need to put on the yarn to get a consistent stitch, which feels like a lot more tension than I'm used to with basic wool yarns. I ignore the first half of the swatch and measure gauge on the second half, once I've gotten the hang of things. By now, I have a few inches on the real thing! Both yarns came. The first did not work out for what I'd intended, but it is delightful yarn (Fibra Natura Oak - wool/linen/silk) and there should be enough for a sweater for my girl. I have the perfect buttons, too. I ordered yarn on Thursday. And then I ordered some more yarn on Saturday. Driving home today I thought to myself, Maybe my yarn is here! But I couldn't remember what it was. I couldn't remember the intended project, I couldn't remember the type of yarn, I couldn't remember the color. Nothing. I kind of thought it might have been for the copy of my favorite store-bought hoodie I want to make in a more fun fiber, but the one thing I could remember was the price. And $25 is not a sweater's worth of yarn. Soon I get home and the shipment hasn't come and I find myself back on WEBS, hunting more yarn. (Because I KNOW the hoodie still has no yarn! Real problem!) And I find some interesting linen/wool/silk in the closeouts section and I'm about to order a sweater's worth of it when I start to have the strange suspicion that I have looked at this yarn before. That I might even have bought this yarn before. That this might even be the yarn I bought on Thursday. But it wasn't for the hoodie! No, now I remember! It was to combine with a cobweb yarn I hated on its own for a scarfy/shawly thing. And then I realize, maybe I should wait for the first batch to come so I can make sure I really like it before ordering enough for a sweater. 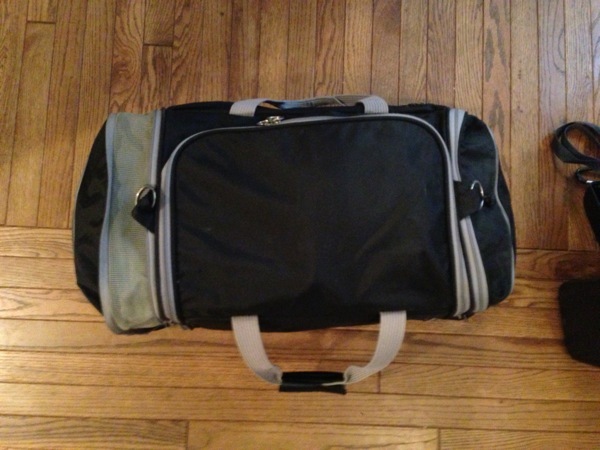 See how practical and reasonable I am? A handknit gift needs no adornment, but you do want to make sure your work gets the presentation it deserves! I had a chance to use my favorite wrapping last week for a dear friend's shower and I realized this is a great place to share the technique. It's so easy, quick, adorable, and unique! You just need a pack of flannel baby blankets. Choose the one that best compliments the card or toy or book you're going to decorate with at the end. Fold the others neatly into the right size and shape. 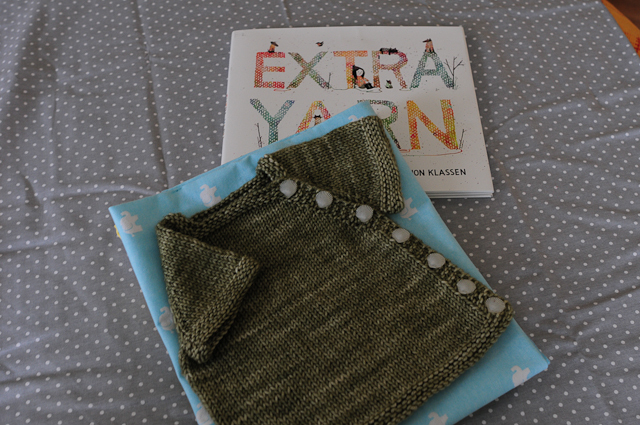 For this shower, the request was for a storybook to be used as the card — Extra Yarn, a new Caldecott Honor book, is utterly delightful and the perfect thing to go with a knitted gift! So, I folded the extra blankets to be just a bit bigger than the book. Lay the chosen wrapping blanket out on your table like a diamond. Make sure the wrong side is facing up! The stack of extra blankets goes in the middle, straight (so the corners of the upside-down blanket are coming out from each side of the stack — as close as you can get it, these blankets aren't square so it won't be perfect, but I promise that's ok). Arrange your knitted gift on top and fold the top corner of the upside-down blanket down over the gift. Then, grab the side corners of the blanket and tie them in a simple knot right over top of your gift. Finally, the bottom corner folds up and you tuck it down over top of the knot. Sometimes I add a diaper pin for effect. Either way, looks like a swaddled baby and who doesn't love a swaddled baby? Plus, no wrapping junk to throw away! Here's my first Either-Or, ready for the cuff. I feel Dr. Seuss might find this mitten inspiring. But I could not wear it.